Mosmetrostroy is one of the big-scale Russian companies engaged into construction of major facilities of urban transport infrastructure. Its history has started in 1931, when it was necessary to implement the government’s decision to build a subway in the Russian capital. For 80 years the workers of the company have built 180 Moscow subway stations, laid 600 km of main line tunnels, and constructed junctions and more than 30 km of hubs. The subway stations were appreciated not only by the people living in the capital and visitors, but also by juries of many international contests in the area of subsurface construction and architecture. And the company has been awarded with higher state awards and premiums many times. Сurrently Metrostroy continues to work on the development of Moscow subway: construction is under way at 30 construction sites and 5 lines. The company also implements projects abroad. Traditionally the capital city experts consult and render support at initial stages of each new subway construction: in Nizhny Novgorod, Yekaterinburg, Saint Petersburg, Baku, Tashkent, Kiev, Tbilisi, Erevan, Alma-Ata, and Calcutta, they helped to build the subway in Prague and Warsaw. In January 2006 Mosmetrostroy, in a consortium with Association Ingeocom CJSC and ALKE and STFA, two Turkish construction companies, won a tender for the construction of hydraulic engineering tunnel under the Bosporus. The Melen Project will secure the supply of drinking water to Istanbul. It was necessary to lay 25 kilometres of tunnels in order to construct 150-km water supply. 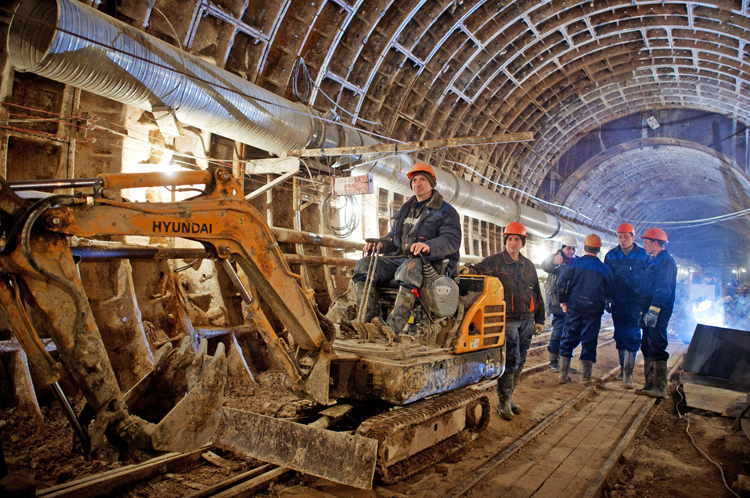 Moscow subway tunnellers worked at the most difficult part of the construction under the Bosporus. 3,400 meters of tunnel at the depth of 135 meters were laid applying shield method. After the research into the initial geological examination results the experts determined that the tunnel will be laid in diverse subsurface and hydrologic conditions crossing zones of tectonic disturbances and faults. The company purchased a Herrenknecht tunnel boring machines (TBM) with the diameter of 6 meter. It was the first experience of such large-scale projects abroad. The construction of the tunnel finished successfully on April 2009. The subway tunnellers managed to connect the two continents in just 15 months. The tunnelling in such extremely harsh geological conditions has shown once more that the level of Russian tunnelling equals to the skill of their foreign colleagues. Only a year has passed and Mosmetrostroy, together with the Minrav, an Israeli construction company, won a tender for the construction of a part of the high-speed line between Tel Aviv and Jerusalem. Israel Railways Ltd. is the ordering customer of the project. The project is one of the largest in the country and has a status of the national one. The new Jerusalem - Tel Aviv line shall end at a subsurface station 80 meters below Jerusalem after going through a series of railway tunnels. Russian professionals make two parallel tunnels of 3.5 km each using the Herrenknecht TBM. Still, at the end of 2011 a new project was added to the pool of foreign projects of the Company. A consortium, which included Mosmetrostroy and Gammon India Limited, won a tender for the construction of a part of subway in Chennai city, the fourth largest city in India. The tunnel will be almost 9 kilometres long and shall include 7 subway stations: Govt Estate (Secretariat), LIC building, Thousand light, Gemini, Teynampet, Chamiers road, and Saidapet. The city is growing rapidly; now about 8 millions people live there. The city infrastructure is in need of a modern, convenient, reliable, fast, and economically wise transportation. The experts are sure that the construction of subway will help to integrate other types of public and private transportation and will allow facilitating efficient management for the urban transportation system. The tunnelling will be done with four tunnel boring machines. As a whole, the Chennai Subway Project contemplates construction of 19 subway stations and 18 kilometres of tunnels. Mosmetrostroy’s desire to work on international projects is due to the growing global demand for complicated subsurface engineering structures. This Russian company compares favourably with many construction organizations which have to retrain their engineers and workers for subsurface works. It has all the resources (special-purpose construction and assembly offices, cutting edge technology, the newest equipment, and in-house production of materials) to delivery “turn key” subway projects, starting from earthwork and ending with finishing works.